Our House has an Anchor: We made it! After a grueling several days in transit by land and by sea, we are finally settling into our new home in South Beach. We left Louisville last Saturday morning, then drove about 8 or 9 hours to Charlotte, NC, to visit some friends. Normally, a eight-to-nine-hour car trip isn't that bad, but with a car so loaded you can hardly see and with a kayak strapped to the roof that both slows your progress and leads to endless worrying, it was rough. Sunday night, we left Charlotte, spent the night at a hotel near Savannah, and then drove to Titusville, FL, Monday morning. When we arrived at the boat, black clouds were rapidly approaching. They arrived before we made it down the dock to the boat, and they brought a wild storm with almost zero visibility and winds so hard that almost every boat docked in the marina was leaning ten to twenty degrees--with no sails up! We could see Sea Gem at the end of the dock, and she was barely moving, which made us feel good about our boat choice. Once the rain passed and we closed on Sea Gem, we stayed up late unloading all of our possessions from our cars down the dock and into the boat. This took hours, it was miserably humid, and we were too tired to think straight. We had intended to take pictures of the interior of the boat at the time, but it was such a disaster zone with all of our stuff piled up, and we had so much to put away before leaving in the morning, that we skipped the photos. They will come soon enough, of course. Our primary goal was to put things away just enough to be able to use the boat to sail down to Miami starting the following morning. Our solution was to stuff almost all of our stuff into one of the staterooms. Tuesday morning, we set sail for Miami. We started out with Charlie, the original owner of Sea Gem, and headed a couple hours south to Cocoa, FL, for lunch. Charlie of course made handling and docking the boat look easy, and gave us some good pointers for the future. On the way, we were hit by a storm with 38-knot winds (tropical storm force). The boat was extremely well behaved through the storm, but we had trouble spotting the channel markers through the rain with the reduced visibility, which was sometimes less than a hundred yards. Fortunately, we made it to Cocoa (and some great Thai food) without running aground. Tuesday afternoon, we met Captain Rob, a local captain who agreed to help us sail the boat to Miami, and we set sail for the south. Actually, we didn't raise any sails Tuesday, as we had to travel through miles of narrow channels before we could get out to the Atlantic. We found a spot to anchor before the sun set, although it was not quite ideal. We anchored in only 6 feet of water, which left us very little room for error and tides (we draw just over 5 feet). Although the wind changed (which put us within ten or fifteen feet of a neighboring boat), we stayed afloat (the lowest depth reading we saw was 5.6 feet). The ability to anchor is 6 feet of water is definitely an advantage of Sea Gem over other boats we looked at, some of which drew as much as seven feet. Wednesday morning, we resumed motoring through the narrow channels. On the way, our starboard engine broke a belt and had to be shut down. In most boats, this would have been a nightmare. We'd have had to try to drop our anchor before we blew aground, then tore the interior apart while trying to fix the engine. On Sea Gem, we were able to keep moving forward with our port engine (the Gulfstar 54 is one of very few sailboats with two engines), and I was able to fix the starboard engine (the broken belt was the last belt, so I had to remove and replace four others in addition to the broken one) in the separate engine room without tearing up the interior. And Charlie, the former owner, had several spare belts on board and clearly labeled all of the required tools, so I wasted no time searching for everything. We had the starboard engine up and working perfectly within thirty minutes. Easily the best boat-repair experience I've had. The sail south was just perfect. For a couple hours, at least, until a massive storm rolled through. Our wind-strength meter registered 45 knots during the worst of it, and stayed at around 40 knots for about half an hour--easily the strongest winds I've ever sailed through. Sea Gem handled the storm without problem, however, and we stayed dry and comfortable in the enclosed cockpit. 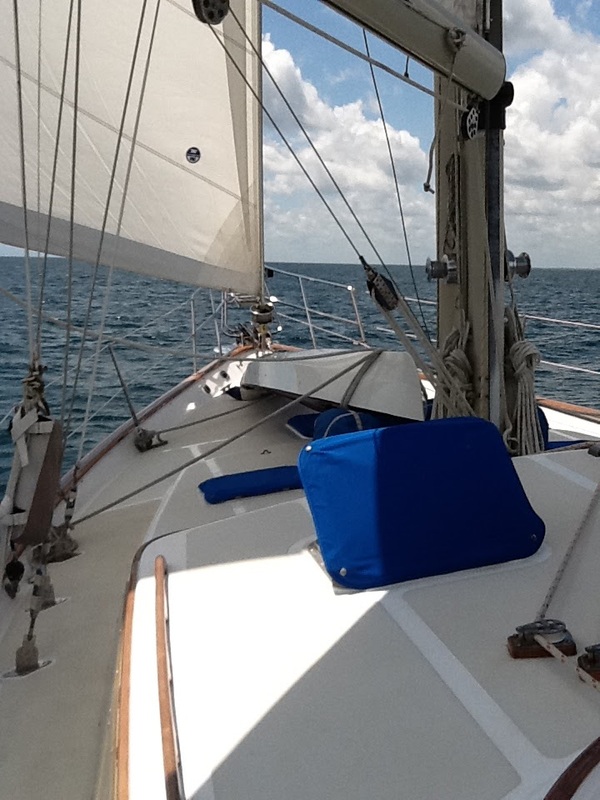 Storms came and went through Wednesday, but Wednesday night was a very calm and comfortable motorsail to Miami. We took shifts sailing the boat so we all got at least a few hours of sleep through the night, arriving Thursday morning at around 6 am. I docked Sea Gem for the first time, and even though it was still dark out, I pulled it off without destroying anything. Once we arrived, it would have been a great time to sleep and relax. But, unfortunately, we had to drive back to Titusville to get our cars and then drive back to Miami. I can't think of anything I've had rather done less than spend another day on the road at that point. But, several hours and even more servings of caffeine later, we made it back to Sea Gem in Miami Beach Thursday night and slept like rocks. Then, two days of unpacking our stuff, and now I need to get ready to start my new job tomorrow. Although we haven't had much of a break all week, living on Sea Gem had been very comfortable and relaxing, and we really couldn't be happier with our decision. More soon. Glad the trip was completed safely! Can't wait for pictures and more stories :) Hope work is going well!